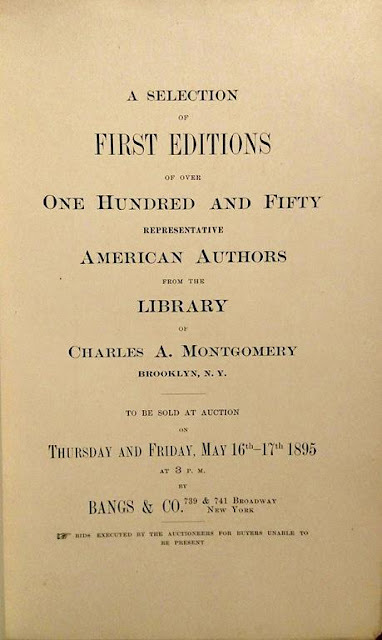 A SELECTION OF FIRST EDITIONS OF OVER ONE HUNDRED AND FIFTY REPRESENTATIVE AMERICAN AUTHORS FROM THE LIBRARY OF CHARLES A. MONTGOMERY, BROOKLYN, N.Y. New York: Bangs & Co., May 16-17, 1895. Introduction by Montgomery. 603 lots. Prices realized laid in. 8vo. Printed wrappers. Charles Alexander Montgomery (1857-1933) of Brooklyn, New York, was one of the early collectors of American literature. His strong focus on original condition was ahead of its time. He compiled this auction catalogue himself providing more bibliographic detail than usually encountered and included extensive notes about the condition of the books and their contents. The notable collector, Charles B. Foote (1837-1900), another pioneer of American literature collecting, seems to have been a role model and “rival” as Montgomery cited Foote’s copies often—Montgomery’s examples usually in better condition. Montgomery outlined his approach to the catalogue and his collecting philosophy in the introduction: “To All Who Love Books: In compiling this Catalogue of some of my books, I have endeavored, in the first place, to secure accuracy; but no one who has not attempted similar work can fully realize the truth of what Mr. Henry Stevens (‘of Vermont’) says in his ‘My English Library’: ‘If you are troubled with a price of accuracy, and would have it completely taken out of you, print a catalogue’”! “In some respects—perhaps many—this Catalogue will be found both original and unique! Every book has been measured by the standard scale of sizes adopted by the American Library Association—the result being a certain uniformity of description which is usually lacking; though in some cases the sizes seem rather arbitrary, and I have guided more by the height, than by the width of the books. Another exceptional point---all titles have been given in full; unnecessary, but more satisfactory, on the whole—especially to the printer! . . .
That certainly was a surprise ending. His blend of bibliography and vegetarianism deserved a closer look. Who was this pioneering book collector who was also a trailblazing vegetarian? A few examples of his publications include the following. All are scarce to rare now: Goodholme’s Domestic Cyclopaedia of Practical Information (1885), Perfect Bread: Its Preparation and Use (1886), and The New York Cake Book: Fifty Recipes by a famous New York Chef. (1904). Adolph Growoll, publisher of Publisher’s Weekly and indefatigable recorder of book trade history, wrote in Book-Trade Bibliography in the United States in the XIXth Century (1898) that Montgomery was a member of the Dibdin Club and that he owned one of three known copies of the earliest book-trade catalogue issued in the United States (Boston: 1804). Montgomery’s copy was reproduced in Growoll’s book. 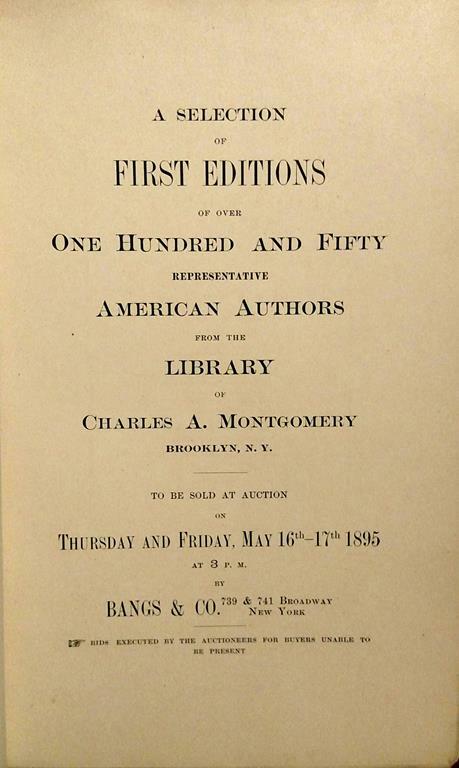 Two other auctions of Montgomery’s books are recorded by McKay in American Book Auction Catalogues, 1713-1934 : May 11, 1896 (4528) and May 22, 1907 (6335). This last auction, Some Bibliography. Including the Most Complete and Perfect Catalogue of American Publications, 1774-1900. . . (344 lots) was also catalogued by Montgomery and showed his deep interest in book trade and bibliographic history. Montgomery’s copy of the 1804 book trade catalogue was sold in this sale for $50. Montgomery’s enthusiasm for vegetarianism was reflected in his position in 1895 as treasurer of The New York Vegetarian Society and later in 1902 as secretary of the Society. Montgomery’s avocation is glimpsed throughout 1902 in various references. A December 3, 1902, New York Times article with the wistful headline, “To Annex Mars and Make Meals on Air,” quoted Montgomery, “Vegetarianism meant temperance, anti-vaccination, anti-vivisection, cremation, anti-war and universal peace.” This certainly covers a lot of ground and firmly classifies Montgomery as a free-thinker of sorts. After 1907, I can find little reference to Mr. Montgomery and wonder how he occupied the last twenty-five years of his life. I’ll bring this brief glimpse to a close, fascinated but unmoved by his bookish vegetarianism. It is time to head outside and smoke a prime cut of brisket in my pit. Believe it or not, I have been to East Aurora, eaten in Hubbard's Hall, seen the beam with the word "fletcherize" carved into it, and understood what it meant because I had run across the word in preparation for UIL spelling bees! I guess I'd have to skip lunch with either of these bookmen: in one case because of no meat on the table and in the other because it might take all day to fletcherize our meal. Just give me a beer and a brat and let's move on to the next bookstore!